Recently the University hire some man powers of various positions. All information you get down in job circular. 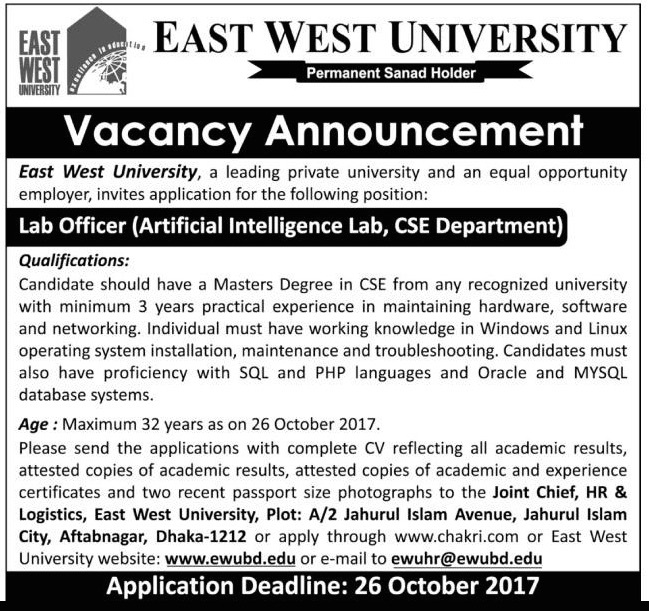 If you interested lets check the East West University Job Circular 2017. The East West University bring out a great career opportunities in education sector. East West University think that young and energetic people is the key to success in this type of sector that can create brightness in our country. If you want to apply for this job; you should submit your application within 26 October 2017. East West University original job circular converted to an image file; so that everyone can read easily or download this job circular. The East West University Job Circular 2017 has been given bellow. Best Curriculum Vitae (CV) Format Download….. If you latest government jobs circular news with right time to connect with onlineresultbd.com. We Make sure all types of latest jobs news/ information such as all private bank jobs; news; private university lecturer jobs in Bangladesh embassy jobs in Bangladesh; prothom alo jobs; government; and jobs in Bangladesh; most recent jobs in Dhaka; The East West University Job Circular 2017 new; airlines jobs in Bangladesh and so on. Our main aim becomes a best jobs circular website in Bangladesh. So just; keep connected with us as well as like our Facebook Page and Join with Facebook Group. Hopefully you will be huge benefited by publishing recent jobs circular information.